There were a number of "one-year wonders" introduced in the 1960's, or watches that were only produced for a single year. I sometimes wonder if Hamilton was pulling out all the stops and putting anything that would tick on the market or if their marketing folks were so in tuned with what customers wanted that they killed things that didn't sell well. Maybe it was a little of both? Another theory is a shift in their supply base as they moved away from 1950's era Swiss watch movements and into 1960's grades from different makers. The 1960's designs allowed for thinner watches, which may have been more fashionable. That's probably a more plausible theory. A good example is the 1961 Automatic K-418. It was only produced in 1961 and it was one of the last years to use the Kurth Freres 667 movement. Most of the automatics in the 1960's were micro-rotors from Buren or ETA-based grades. 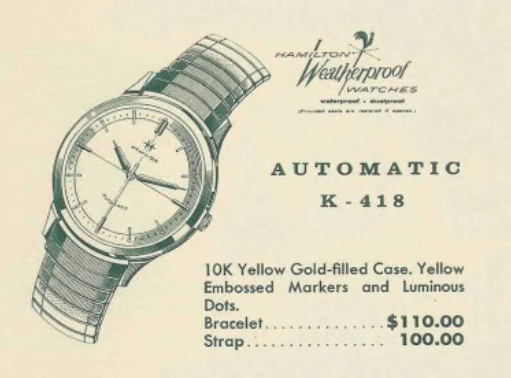 The K-418 has a 10K gold filled case, as you would assume since it's a 400 series watch. The embossed dial is unique because it has a golden ring on the outside perimeter as well as a field of raised rings in the center. The watch features luminous hands and dots outside the hour markers. Tucked inside the case is a Hamilton 667 movement. This movement looks a lot like the 661 that was very prevalent in the earlier automatic models. The 667 is the grade found in one of the most rare Automatics... the Pacermatic, which is an electric Pacer case with an automatic inside. If you ever come across a Pacermatic, make sure it's not a fake. The best way to tell is the serial number of the case. Pacermatics have case serial numbers in the 528500-528800 range and 637700-638200 range so there were only 800 total made. My project K-418 arrived in relatively good order. The lugs have a little wear to the inside thanks to a metal bracelet. The crown is worn smooth - it's so small that I doubt it's original, but maybe. It's a little hard to read, but the back is engraved with a name and the date "1964". That's interesting, since the watch was produced three years earlier. The 667 inside appears to be in good order but I'm sure it will benefit from a trip to the spa. As you can see, there are a lot of parts to these watches. There are a variety of different screws too and I think it's interesting how often I find the wrong screw in the wrong place. You can see I spilled a little of my luminous powder on the cloth as I relumed the hands when everything was in the ultrasonic. One of the tricky parts to reassembling this style of movement is to get the train bridge on. Three wheels have to be lined up at once... the 4th wheel in the center, the 3rd wheel to the below right and the silver escape wheel just to the left. Some of the nickel plating on the main plate has been lost to time. In the shot below, this is the angle that I have to look in order to tweak the wheels and get their respective pivots into each corresponding jewel in the train bridge. The bridge will fall into place when everything is lined up. If it's line up correctly, when I spin the center wheel, all four wheels will whirl around. After the train bridge is on, I can put on pallet fork (left) and the barrel bridge along with the winding wheel and ratchet wheels (right). Next to go back on is the balance assembly. With a few turns to the mainspring, the watch will start running if the balance is in the right place. The now-running movement goes onto the timer. Nothing too shabby about this watch. The amplitude of 183 is a little low, but I didn't fully wind the watch yet. Now that the watch is running, I can put on the rest of the parts that are needed for the automatic mechanism, there's a rotor carrier as well as a clutch wheel. The clutch is just below the winding wheel in the shot below. It enables the watch to wind in only one direction, but allows the rotor to move in either direction. The rotor carrier can be a bugger to get back on. There are three moveable connection points that have to be properly aligned for the carrier to seat. It takes a little finesse to get all three lined up at the same time. The crown needs to be replaced but the stem is pretty rusty too. It's not terrible, but I'll replace it with a new one when I install a new crown. The dial and hands go back on and the movement goes back in to the case. The new stem is too long and will need to be trimmed to just the right length. The best way to hold a stem for trimming is with a pin vice. I have found that when trimming stems it's best to leave them a little long and slowly work your way to the perfect length. Too short means you have to start over. With the movement running and back in the case, the last thing to go back on is the rotor, aka, the oscillating weight. As this part swings around on the red jewel, it winds the watch. The rotor drops in place and is held in place by the little toggle switch above the arrow. A new crystal and strap complete the overhaul. The finish on the dial is a little lighter on the right side - I suspect that's the effect of moisture coming through the stem. It's not obvious though. I wonder if cleaning the dial would make it look more even but this is a classic "know when to stop" situation. I could just as easily ruin this dial by cleaning it any further. It's not perfect, but it's 50+ years old, so not being perfect is okay. How much do you think its worth I have one just like it?